6:05 PM EST. OT included. Does anyone even understand how unlucky a team has to be to lose 10 games in a row in this sport and league? There’s a reason it rarely happens and it’s because hockey is such a luck-driven sport. Furthermore, the Ducks are actually not a bad team with great goaltending so that makes this awful funk even more unlikely. The good news is that the Ducks take the road after a six-game homestand and one has to figure that they’ll leave nothing on the table here. We’re almost sure that the Jets are going to need a lot of luck to win this game because they’re just so ripe to get beat here. Well, sure enough, that’s precisely what happened, as the Jets were badly outplayed and were under siege for the entire third period and most of the game, as you can see on the graph below. 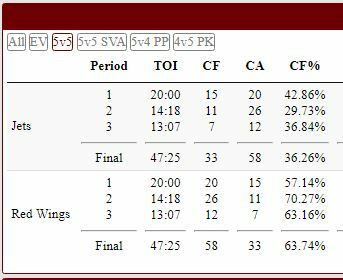 Winnipeg scored 15 seconds in, scored another with one second left in the first period and scored one more early in the second. The Red Wings would rally to make it 3-2 with 13 minutes left but could not get the equalizer. Backup goaltender Laurent Brossoit made several high quality saves and was the games’ number one star. Yes indeed, the Jets won but did not deserve to. Earlier this week, the Jets were absolutely dominated for 60 minutes in an extremely fortunate 7-4 victory over the Avalanche. The Jets were outshot 41-21 by Colorado and scored those seven goals on those 21 shots. The entire game was played in Winnipeg’s end. The next night, Winnipeg looked fatigued for the first two periods in Minnesota before finding some energy in the third. Now the Jets will play their fourth game in six days and sixth game in nine days. The Jets are still shorthanded with at least two key players (Ehlers and Byfuglien) out and with two more key players questionable (Tyler Myers and Mathieu Perreault). Chasing the puck is exhausting. The last three games that is precisely what the Jets have been doing. Completely spent, Winnipeg will now play what figures to be a highly motivated and very hungry Ducks’ squad. The price is sweet and the Ducks have not eaten in a very long time.